Food allergies are no joke when someone’s health is at risk. Researchers estimate as many as 15 million Americans have food allergies ranging from moderate food intolerances to severe reactions. A food allergy is the abnormal response of the immune system to proteins in foods, and any food with protein has the potential to cause an allergic reaction in vulnerable individuals. According to the Soy Connection, eight food groups – the “Big Eight” – account for more than 90% of all food allergies worldwide and include milk, eggs, fish, crustacea, peanuts, tree nuts, wheat and soybeans. While the “Big Eight” give you plenty to be diligently mindful of in your kitchen, there’s one ingredient you may not have to sweat over – cooking oil. Never wanting to put a customer’s health in jeopardy, a common question among restaurant owners is whether soybean and peanut oil are safe for consumers with food allergies. You may be surprised to know these types of oils are generally regarded as safe to consume by those vulnerable to allergic reactions and it all has to do with the processing method. Most soybean and peanut oil is manufactured via the hot-solvent extraction process with refining, bleaching and deodorizing in the United States. This process removes virtually all of the oil’s proteins – which are the main components of an allergic reaction. The FDA has even exempted highly refined oils, including soybean and peanut, from being labeled as allergens because of the processing method and removal of proteins. Studies have shown that most individuals with soy or peanut allergies can safely eat foods cooked in these oils depending on the processing method. While highly refined is generally regarded as safe, some oils are made by cold-pressing (also known as expeller processing) where soybeans and peanuts are squeezed to produce the oil. This manufacturing method is less processed and does not remove protein so they should not be consumed by those who have food allergies. Cold-pressed oils are typically found in grocery or retail stores and are rarely used as a bulk oil ingredient. While your fryer cooking oil may not be a danger for customers with food allergies, other areas of your kitchen may be putting them at risk. To create a safer dining experience, hang food allergen posters in your kitchens so employees are mindful of food preparation and reminded of the dangers of cross contamination. 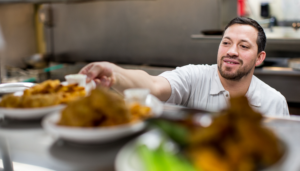 Additionally, Food Allergy Research & Education, Inc. offers a SafeFARE program where employees can complete an allergens course to get your restaurant on an “allergy aware” restaurant database. If individuals are allergic to specific kinds of food they should always discuss with their doctor what they can or cannot safely eat. The FDA advises consumers who are allergic to particular foods to ask questions about ingredients and preparation when eating at restaurants or any place outside of their home. An easy and effective way to help inform your consumers of potential allergen risks is to put ingredient disclaimers and/or statements on menus. The key to avoiding a potential allergen risk is training, transparency and prevention. Jason Cocco is Vice President of Business and Product Development at Restaurant Technologies. He has more than 15 years of product development and general management experience within the consumer goods, high-tech and retail industries from past positions with The Nielsen Company, Accenture and Procter & Gamble. prior to joining Restaurant Technologies in 2011.